Independent troubleshooter, Alex Leksin, is asked by President Karpev to report on a planned pipeline to take Russian oil through Turkmenistan and Afghanistan. Karpev’s strategy is to reduce Russia’s reliance on the West by shifting his country’s vast energy resources to the East. Failure would be catastrophic to his presidency. Against a backdrop of political corruption, state sponsored terrorism, and increased Taliban insurgency, Leksin’s investigation takes him from Moscow to one of the world’s most sinister countries right at the heart of central Asia. Initially, his enquiries reveal nothing to cause alarm. Yet, wherever Leksin goes, someone tries to kill him; people who may be able to help him are assassinated; and information turns to misinformation. When at last he discovers the truth, he is no longer sure whom he can trust. Here’s a book that certainly lives up to its title. The lead character, Alex Leksin, is an independent trouble shooter working for the Russian President. The President wants Alex to report on a planned pipeline through Turkmenistan and Afghanistan. Set in the present day, many of the political implications are all too familiar to followers of current affairs. I have not read Eccles’ previous book ‘The Oligarch’ although I gather that some of the characters featured in that story. Personally, I found that it took some time to warm to the main character Leksin. The book starts with several chapters of scene setting and a confusion of players. I am not normally a fan of including a Glossary of Characters, but it certainly helped this time, with there being so many of them. The early chapters did however lack action, due to scene setting, but all that changes as the book develops and we are led through Turkmenistan in to an all action journey to find the truth. Eccles writes in an easy to read style, and like many modern action writers he uses short chapters to keep the reader’s attention, making page turning a must. I understand that Eccles has lived and worked in the area for many years, and that is evidenced by his detailed descriptions of Turkmenistan and its inhabitants. The comparisons between ancient and modern lifestyles, I found particularly interesting. There were some interesting peripheral characters, such as the President, who banned gold teeth, Batyr the shepherd and the fictitious President, who likes to be pictured semi-naked taking part in various sporting activities. I cannot imagine who Eccles could have based him on! I look forward to reading the author’s previous book, and the final part of the trilogy when it is published. 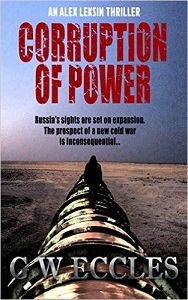 I heartily recommend ‘Corruption of Power’ and I have awarded it four stars. George Eccles left London in 1994 to move to Russia and Central Asia during the tumultuous period that followed the breakup of the Soviet Union. His work involved extensive travel throughout Russia, Kazakhstan, Uzbekistan and Turkmenistan – often to places with restricted access to foreigners. During his time there, he advised a number of real-life oligarchs how best to take advantage of the opportunities that became available as regulation crumbled and government became increasingly corrupt. Against this background, while his novels are fiction, many of its anecdotes and scenes are inspired by actual events. His first novel, The Oligarch: A Thriller, received considerable critical success, being awarded a Silver Medal both at the Global E-book Awards 2013 and at the Independent Publishers Book Awards 2013, as well as being selected as IPPY Book of the Day. George now lives with his wife – and a cat called Lenin and a bulldog called Boris – in a hilltop village not far from Cannes in the South of France.